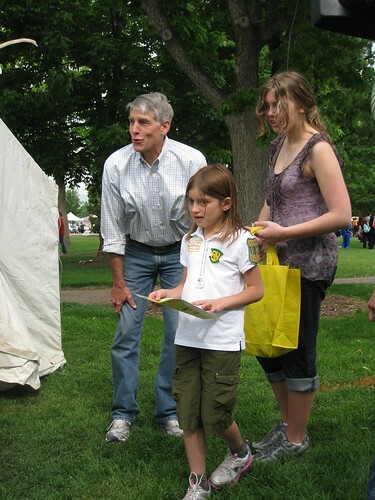 Mark Udall helps Serena Weingarten, 7, and Kelsey Kittelsen navigate through the Junior Ranger Camp as part of National Get Outdoors Day Denver, on Saturday, June 11, 2011, in Denver's City Park. The event connected kids and families of all backgrounds and abilities to nature, encouraging healthy, active lifestyles. Studies show that frequent outdoor activity helps youth maintain a healthy weight, boosts immunity and lowers stress, yet in the last 20 years, the time kids spend outside has fallen by 50 percent. These statistics make the National Get Outdoors initiative especially crucial locally, as well as nationally.